Our garden? Shown here. a 16 x16 plot, scraped clean by tractor and ready for final assembly. We have a water line set to run perpendicular to the southern side, and we’ll tap off it in east-west rows with soaker hoses. You can’t grow anything around here without irrigation. The dirt? Not good, so it will all be amended with topsoil and compost. The compost? This year we’ll be buying compost, because we don’t yet have a bin for it. 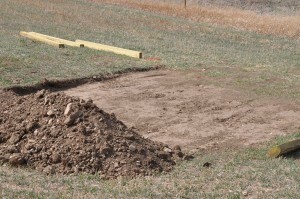 We’ll be building our first pile this year. It will be adjacent to the garden, made from pallets and rebar, which I saw on this website. Looks like a good starting point! The challenges: Frequent chinook winds and rabbits. We live on the front range of Colorado, so nothing is left outside which could blow away. We also have a healthy rabbit population which we are trying to keep in check, but in the meantime a fence should solve both issues, and we’ll be installing one surrounding the entire garden. Growing season? Not yet… but soon. Can’t plant anything around here until mid-May (they say after Mothers’ Day you’re pretty safe), so we have started seeds. I started small. I felt fairly confident with a limited selection to start, so on our kitchen counter, we have zucchini, cilantro, roma tomatoes, and jalapeno peppers. 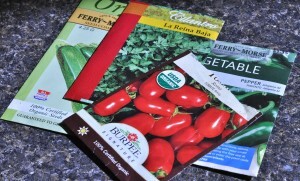 This will be a good start to a salsa garden, and as I gain the know-how, we could add garlic, onion, and berry bushes. 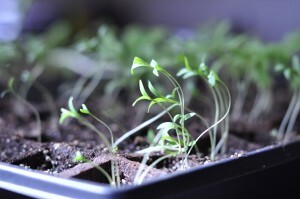 Here are the cilantro seedlings we started in Mid-March. 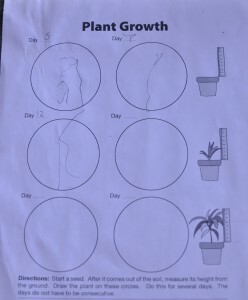 My little preschooler helped with the planting and we’re observing them (scientifically, of course!) as they grow. To aid in that endeavor, I printed this page from My First Science Notebook (eBook version). His little drawings are simple, but good practice in the scientific skill of observation! This is our first garden here, but I’m pretty certain the next steps are to start hardening the plants off with time outdoors on the warmer sunny days to come, then plant them in the garden the second week in May. More to follow as we try to meet the garden challenge! If you’re starting your garden too, leave us a comment and also head over to The Homeschool Village to join the Garden Challenge linkup!